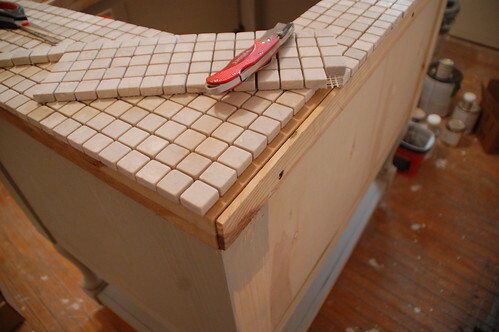 Not only do you have the skills to make this beautiful cabinet, you are also generous enough to make a tutorial (which I’m sure took hours, although maybe not as long as building the cabinet:) Now, get on that poly-ing and grout sealing – the last thing you want is for the bathroom humidity to do a number on your amazing work! FANTASTIC! Thank you for sharing your coolness with the rest of us. Thank you for this post. I was looking at all of your bathroom sneak peeks hoping I’d see this tutorial someday! You did a brilliant job! Ahh, LOVE! I can see some of the bathroom shaping up behind the vanity also, and I can’t wait for the big reveal! It makes me want to re-do my bathroom, but my husband will have a coranary. This looks fab!!! 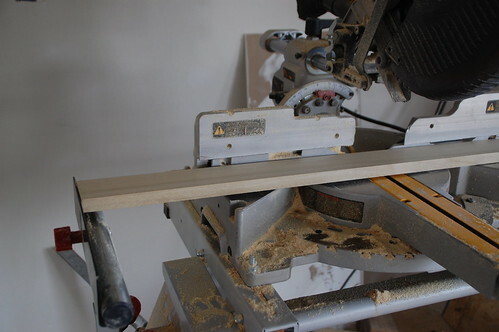 Where did you get that dowel jig? Is it a certain brand? 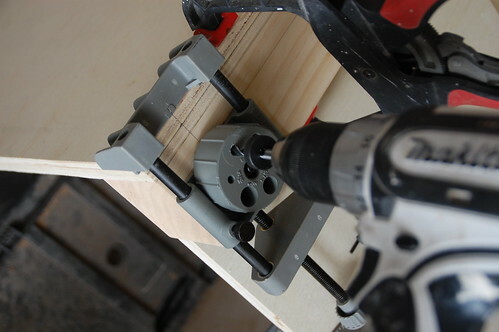 I don’t know the exact brand of the jig, but I found this one in the tool section of lowes. Right by the kreg jigs. WOW, you totally rock! that looks fabulous! I have admired that same exact sink/vanity when I get my catalog. A HUGE thank you to you being so sweet to share the step by step tutorial and written directions and pictures. I know that is time consuming. Oh my gosh, oh my gosh, oh my gosh. I love it! I am showing this to my hubby so I can force him to make it. Hehe:) Thank you!!! AMAZING! that is my favorite PB vanity. Great tutorial! 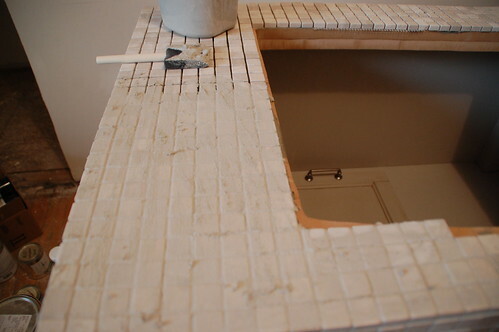 The vanity,walls,floor,mirror,tile countertop- all look so, so good! What colors did you use for the vanity? 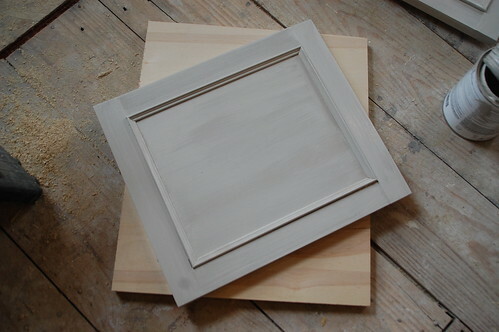 The base color is Benjamin Moore Valley Forge Tan (which is also the base color for the weathered white wood boards), the glaze was a random sample I picked up from Lowes one day — I believe its Olympic “Granite” — and it was mixed with about two parts clear glaze to one part paint or less to do the top coat. Fantastic! Thanks for a great tutorial. If we decide to build our own, we will be “borrowing” some of your steps! And I will totally need to see pics of it! That’s incredible!!! Thanks for sharing. Wow! You are a rock star! I think I like yours better than the PB vanity. 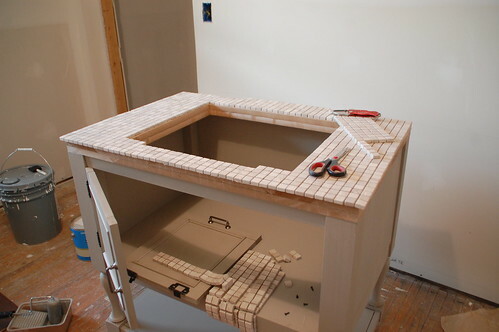 Very nice job on the vanity! This is honestly incredible! 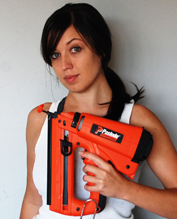 Seriously, one of the best DIY projects I have ever seen. Kudos to you on the vanity AND the tutorial- amazing!! Wow! I actually have the double version of this vanity (and love it) but yours is REALLY amazing!! 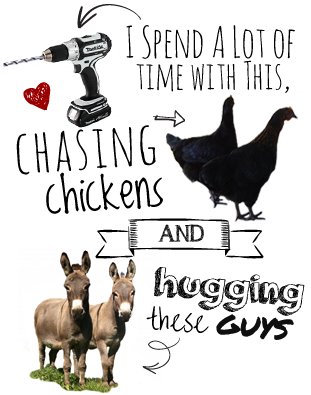 Now I’m wishing we could have DIY’d!! I love it!!!!!!! Where did you get the legs from though? I’m going to see if my husband can make this. Thanks! Nevermind about the legs. I really need to work on my reading skills. I was totally going to re-post the link for you anyway… I do that ALL the time! Also, I didn’t really shop around for those legs since I was in dire need of a vanity at the time, so I’m not saying those were the cheapest option. Unbelievable! That is absolutely stunning. I curse when I sew a seam so I can imagine my children would have been in for an earful if I’d tried to conquer something as amazing as this! I’m sure you are, but you should be SO proud of yourself!! GORG!! Wow! 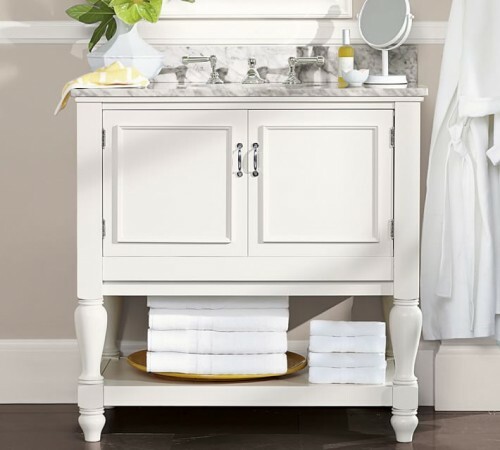 I have been trying to find vanities for my bathroom and I am not finding anything I like. Then I see your blog and I am now reconsidering the possibility of making my own. 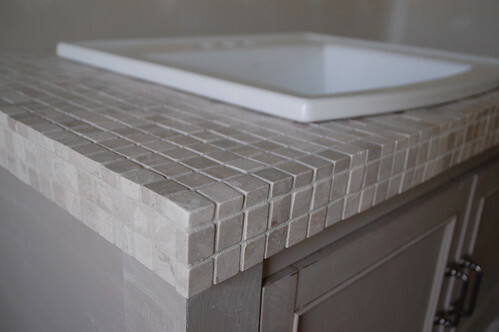 I love the tile on the top! Thank you so much for taking the time to make this tutorial. Simply amazing! I don’t have all of the tools that you do, but I’m wondering if I can tweak the plan a bit and still make it work. You’ve inspired me!! I’m a little behind on my Google Reader and am just now seeing this but um, BRAVO! Seriously, awesome job. This is fabulous! 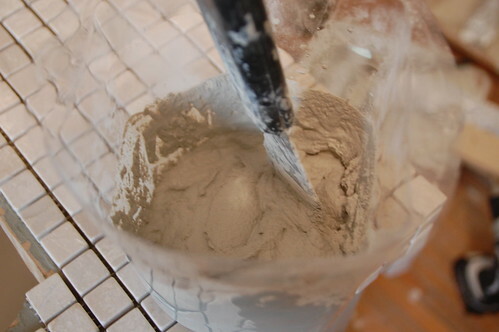 Great tutorial too – I linked it to my bathrooms post as well! Thanks! Wow! SO impressive and pretty! That vanity is absolutely beautiful! BUT, guess what I want to see? Yes, the inside. I want to see where the pipes for the sink are and how they fit in there. Indulge me? LOL. You are so talented… I love it. 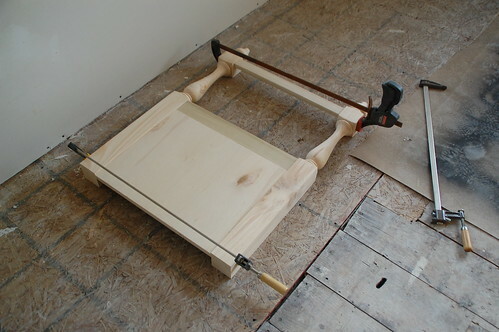 I love your site and am planing on building one of these. Thanks. Kim, I think distressed black would be an awesome look for this piece. You could go a dozen ways with the counter on something like that! If you make one, definitely send pics. I’d love to see it. I love this and we are going for it! Where can I purchase the legs for the vanity??? You are so awesome and helpful. THANKS! I’ll send you pictures when it is completed. 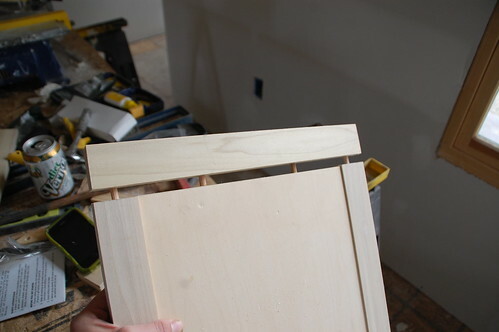 Can you tell us about the wood boards installed on the wall behind the vanity? LOVE THAT TOO! That is a freaking awesome project!! 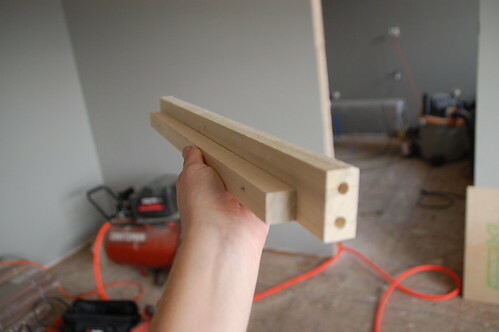 I’ve got to consider using dowel pins for my next project. 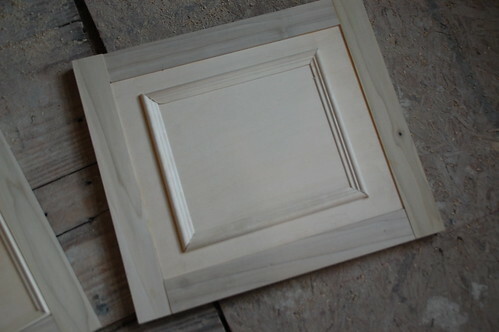 For doors, I’ve mainly used a loose mortise and tenon, because it’s quick and easy. 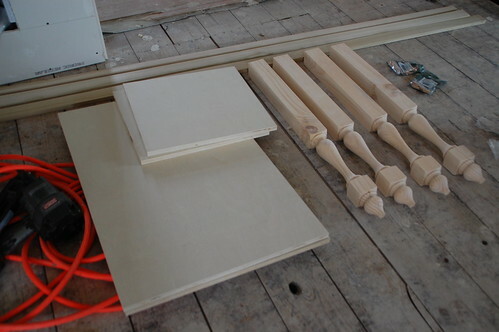 Dowels looks quicker and easier. 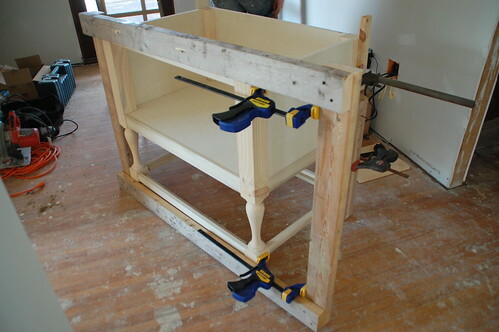 John – I really enjoyed the dowels, but I suggest using a dowel jig, which made it 100 times easier! 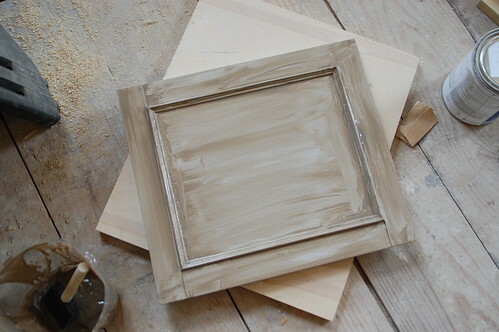 I love the vanity, especially the distressed/glazed color. 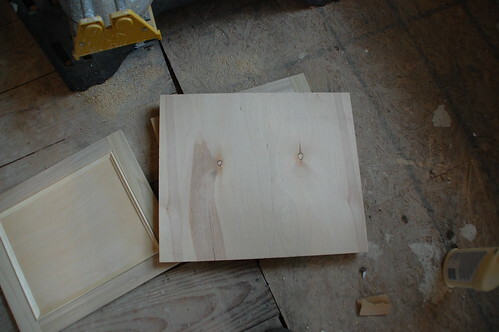 I did this a few years ago and I totally screwed up a cabinet. I never could smear it out right. Looks great, thanks for doubling your work and posting this thread. 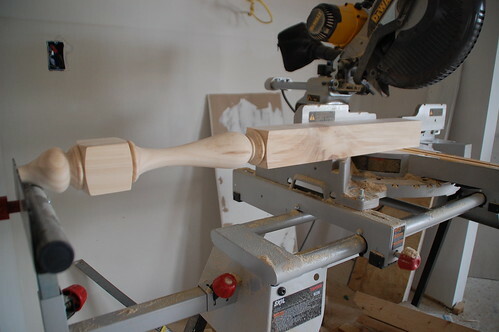 Where do you find the spindles. Cannot find that size anywhere. This is absolutely gorgeous. You do amazing work. 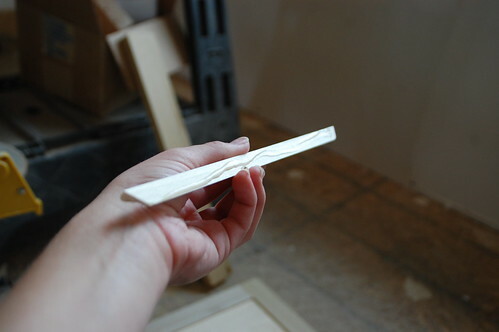 I’ve been doing some tile projects and was told that you have to use the cement backer board; otherwise, the grout/adhesive would not adhere to wood in the long run. Maybe I’ve been misled!! 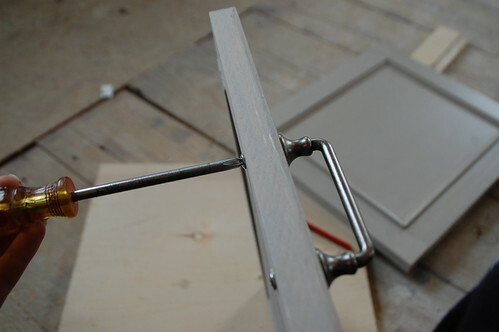 Did you use a grout/adhesive that said it would stay attached to wood? Thank you so much! Hey Joni – This is a really good point. 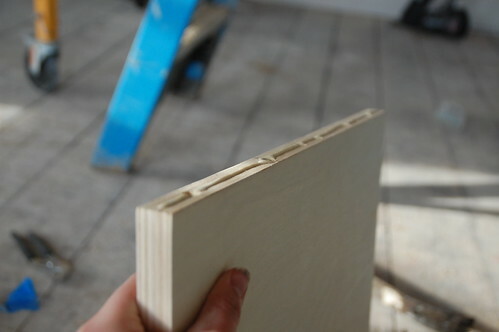 It definitely never hurts to use a backer board, or if that is too thick, something like the Durock Tile Membrane. 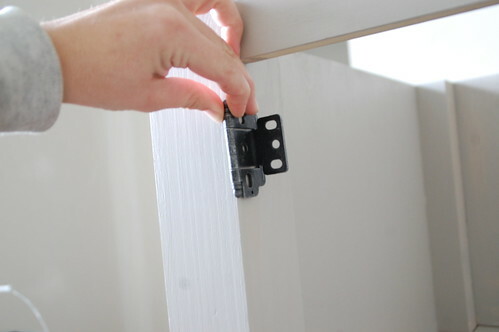 I don’t think adhesion to wood is a problem, usually what backer board solves for is the expansion and contraction of wood (which can crack grout). For something like this that is a really small area and won’t be getting any wear (like being stepped on, etc.) I didn’t feel like a backer board was necessary. I actually did my entire kitchen like this in the last house– covered with 2″ tile and didn’t have a problem with it in 5 years. So, it’s a little bit of a judgment call. 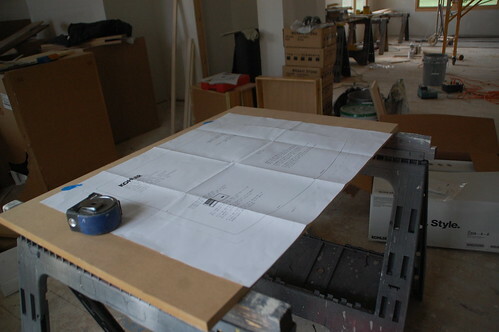 One thing I would always say is to use a backer board on a large space like a floor! Thanks for everything! Which exact legs did you order? I couldn’t figure out which finish to order and whether you ordered regular sonoma, large sonoma, or extra large sonoma? I hope you still look at this so I can order quickly. 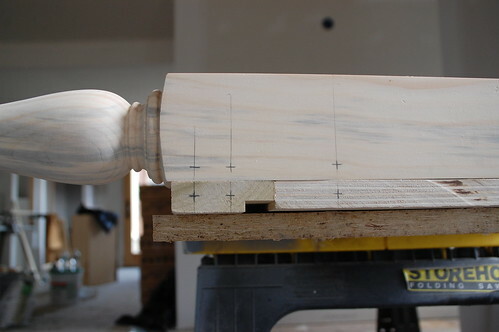 I know she ordered the Sonoma Stretcher Block legs in 2 3/4″ in white pine, because I saw on another post of hers that she only paid $24 each leg. Ha. Thanks Kathy for being so perceptive. You are correct! I absolutely LOVE your vanity! 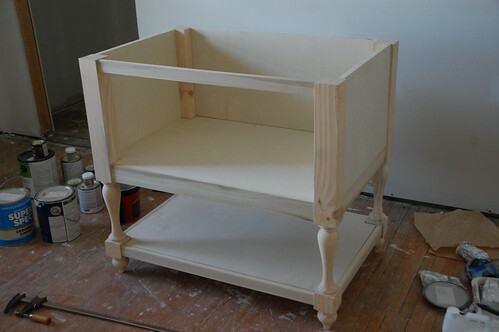 Thank you so much for sharing your instructions, I plan on making this next month with a few tweaks. 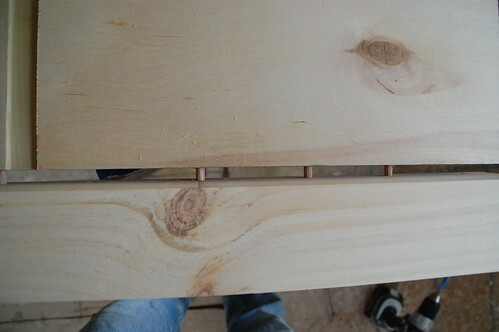 One question I have is, I see you bought the white pine legs from tablelegs.com, which are the same ones I plan to buy. I was just wondering if you had any issues with the knots in the legs, or the knots showing through when you painted? I’d love to see pics when you’re done! 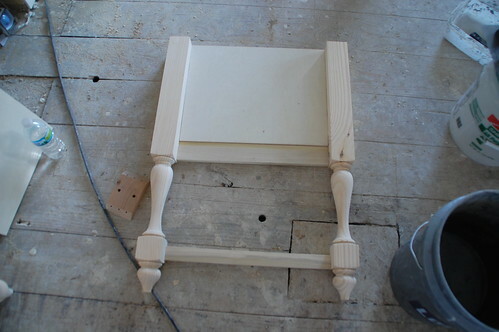 Regarding the legs… I believe only one of them had a knot in it, and it wasn’t visible at all through the paint. 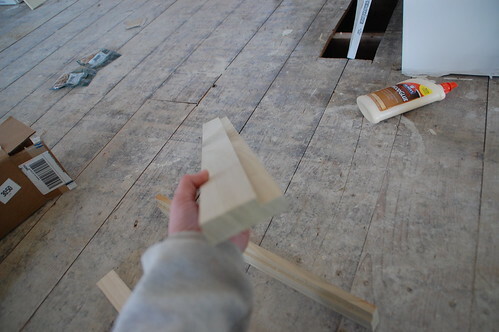 Now, I like things to look a little rustic so I may not have noticed it as much as others, but I think it will be fine! You are my Shero!!! I would have to reread this several times to get. 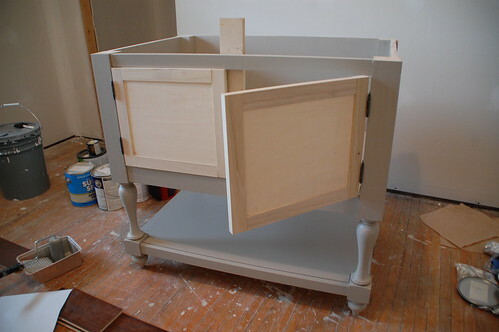 May just look for an old dresser and incorp some of your ideas! AWESOME! 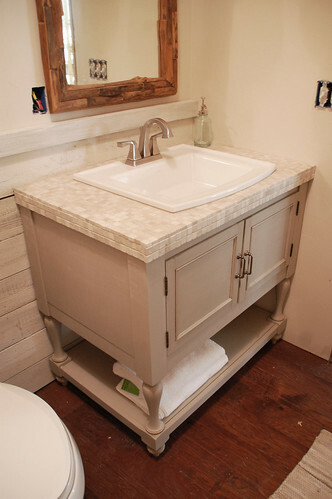 I just googled “how to make a sink vanity DIY” because I’m in love with the SAME pottery barn vanity, and can’t stomach the price, and your site came up! love it! thanks for sharing!! 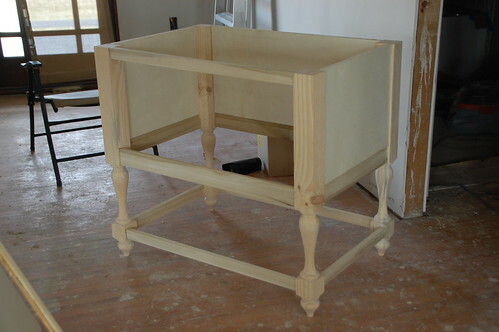 in another picture on your site, you have this vanity in a bathroom that is GORGEOUS. 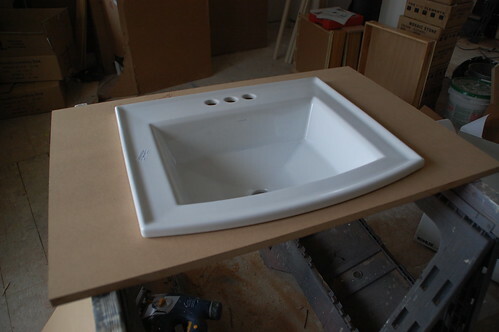 Where did you get your tub that is rectangular-looking from the side? and the tile surround? love it! Stunning! You did an AMAZING job! I love the design… I’d change the legs for square type, but that’s just personal taste. Is there a plan for a matching linen cabinet? We are going to remove the doorway leading from the guest room into the bathroom and I’d like to put the linen cabinet there. This is such a wonderful tutorial. thank you so much for sharing! Would you mind telling us how much money the materials cost roughly? thank you ! 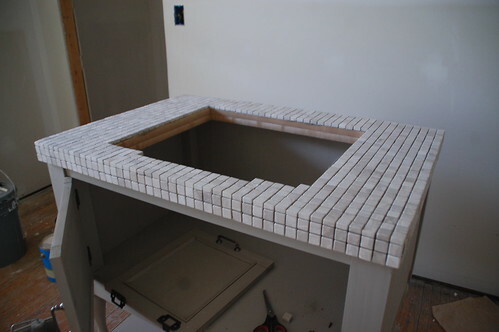 Does your $400 price include the tile counter top and sink, or is it just cabinet alone? You know Marcella, it’s been a while since I built this, but I’m pretty sure it included all of the cabinet materials and the counter, the sink I already had. 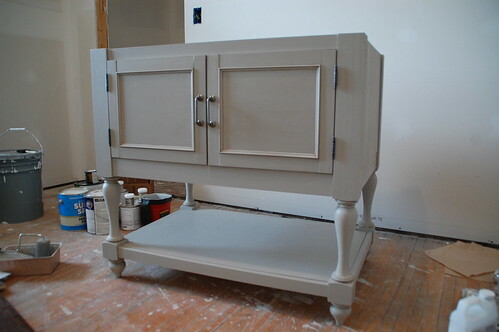 This vanity turned out fabulous! I love the price tag too! 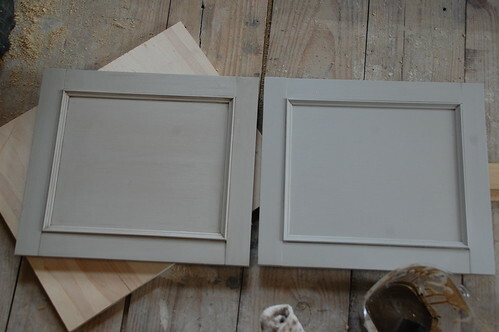 We are getting ready to makeover our master bath (gutting it as I type….well Hubby is) and We will be making cabinet doors, so this tut was totally helpful. 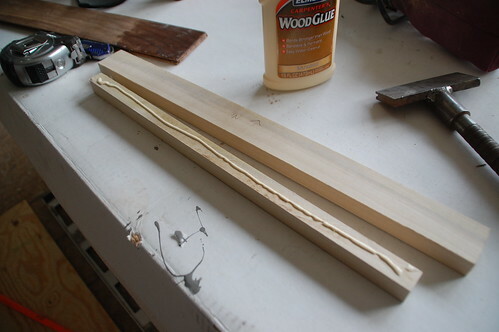 I love the dowel idea. Lovely! Now you are lots of women’s (and maybe some men too) hero!! Great job! This is beautiful! 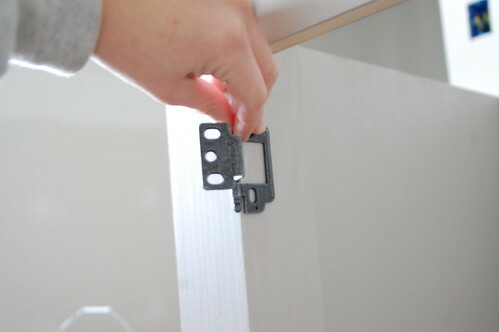 And the reverse clamp method is genius! 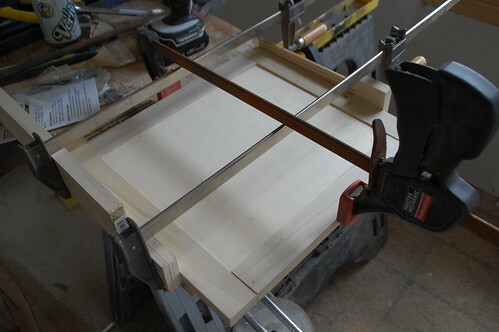 I only have 1 4′ clamp; I will definitely be using that method in the future. thanks for the inspiration! This is a nice design. 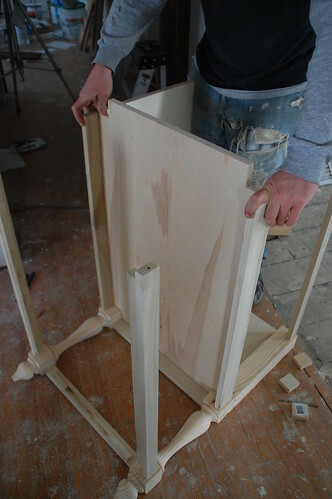 Though you should never build a frame and panel using dowels. 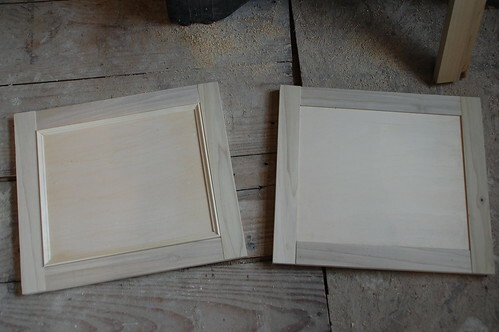 The vanity in a wet environment, those panels will expand pushing out the frame. 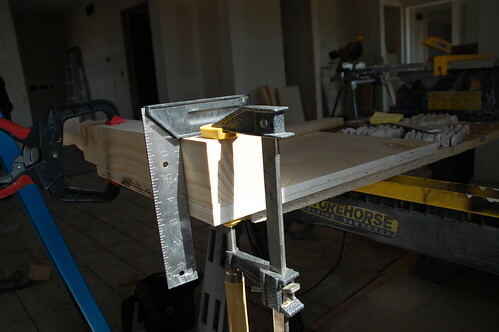 The correct way to build a frame and panel is by routing a slot into the frame pieces and routing a rabbet onto the panel. 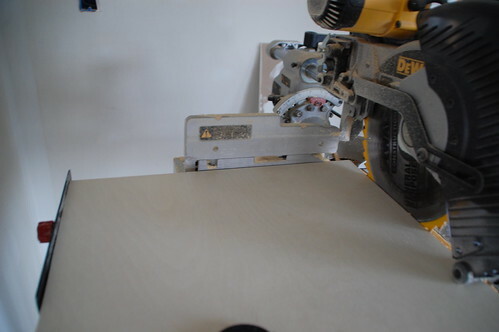 (You can also use a dado blade) No glue is used and the panel floats in the frame grooves which will allow the panel to expand and contract with the changing humidity of the room. 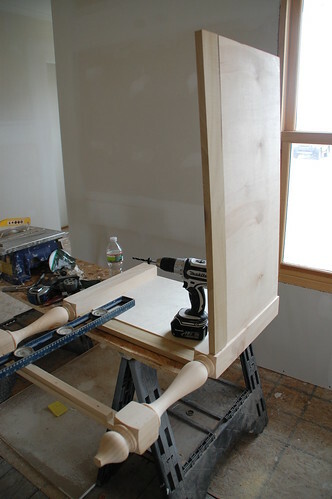 If you build it with dowels or biscuits be prepared to have those dowels open up on you as the glue over such a small surface will be unable to withstand the expansion force. 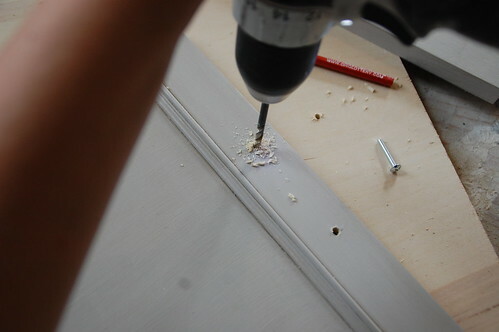 If you can’t create a floating panel my advice would be to use pocket screws. 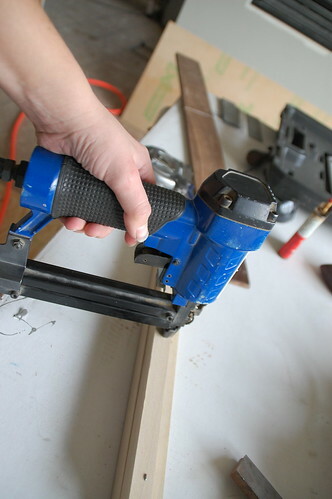 Really this principle holds anytime you build with dowels in a humid environment. Be prepared for major wood movement. 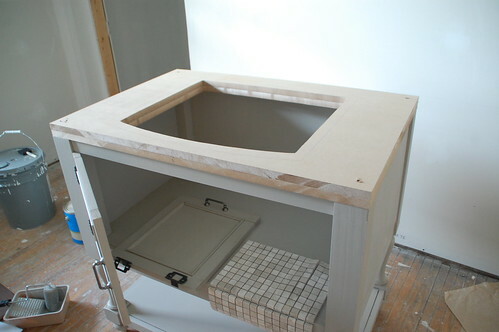 Kit — I would like to modify this for my kitchen farmhouse sink from IKEA. Any help on how to do that would be appreciated.